John Ronald Reuel Tolkien, author of The Lord of the Rings, was a self-described "conservative anarchist". Today such a description would match an influential faction of today's libertarian movement. Tolkein's political ideology actually pervades and forms the basis for his epic Middle Earth tales. Unlike Ayn Rand with Atlas Shrugged, however, Tolkien doesn't hit the reader over the head with his beliefs, rather choosing to let the story display them without fanfare. His writing continues to infuriate academics and other state-apologists; the masses of the public who love it usually miss the libertarian subtext, at least consciously. The novels are at heart an exploration of the problems of power, symbolized by The Ring. Power and evil are inseparable. Power attracts to itself not the innocent and the good, but the evil. Power corrupts. Fighting power with power only brings the corruption that comes with power and the pursuit of it. What do good people do with the concentration of power? They dispel it. As usual, astrology gives us insight into Tolkien's political thinking. The "conservative" in Tolkien's "conservative anarchist" is a little bit tricky. The Moon is square the Nodes, highlighting cultural attitude in some way. Neptune, co-ruler of the Moon, is conjunct the North Node but square the Moon herself. We have a mix of culturally conservative and liberal elements. 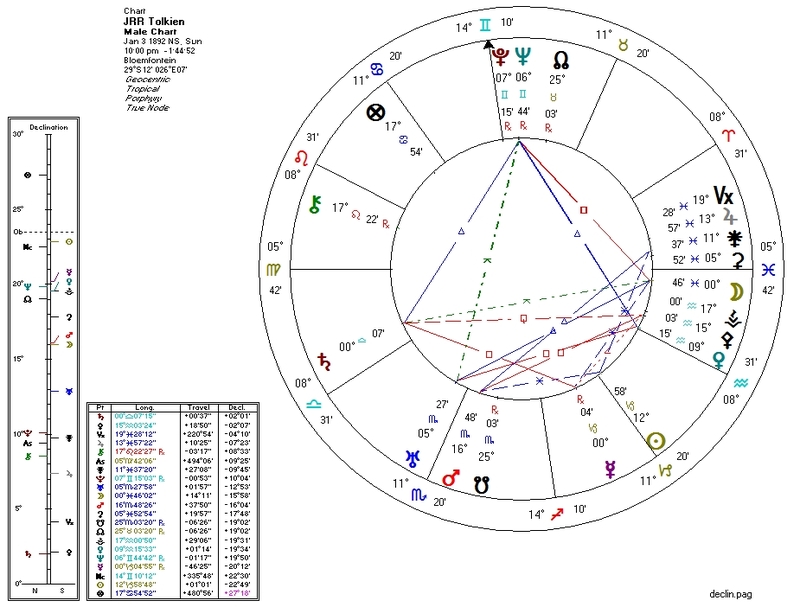 One might argue that the Moon, being angular, wins over the elevated Neptune and that the Neptune/North-Node connection further strengthens the Moon against, oddly, Neptune himself. It's not terribly clear. Note that in Middle Earth, multiple races peacefully coexist albeit in mostly segregated communities; separate, as you might find some cultural conservatives calling for, but not particularly unequal. The economics are mixed as well. Venus, ruling the 2nd House, is trine Neptune: leftward. But the North Node is in Taurus: rightward. Mixed culture and economics together tend to push a chart by default to the Right in modern society. The modern Left doesn't tolerate much compromise, and the modern Right is nothing if not thoroughly compromised. The "anarchist" part is also complicated. On the libertarian side, Mercury is semisquare Pallas and square her co-ruler Saturn. Pallas is sesquiquadrate Saturn, which rules both Mercury and the Sun. This is very strong on the libertarian side. Mitigating this a little is Pluto widely trine Saturn (Pallas co-ruler, also quindecile Jupiter) and quincunx Uranus (Pallas co-ruler). This is a bit of a planetary brawl. I might have expected a libertarian-leaning paleo-conservative rather than a full-on anarchist, but frankly the complexity of the pattern raises some uncertainty as to interpretation. Elves in Middle Earth are pointy-eared, highly civilized and logical, emotionally detached, peaceful and yet highly proficient in combat, a bit mystical, are associated with (magical) weapons, quietly work for the good of all races, and step out of the way when it suits the common good. Sound familiar? Tolkien's elves are an iteration of the Palladian archetype. The world's literature and traditions has at least a few other high-profile examples of the archetype, hidden in plain sight and unrecognized for what they represent.